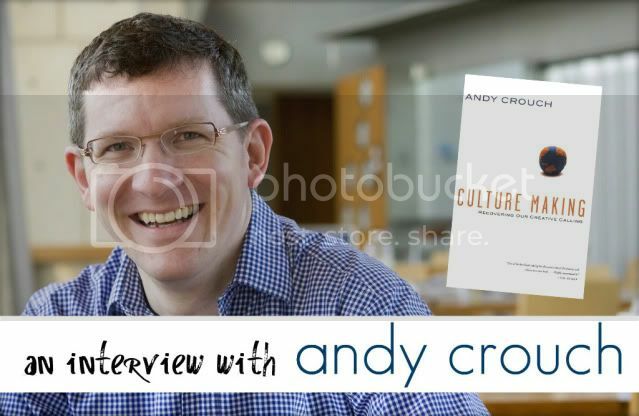 In Andy Crouch's Culture Making (IVP Books, 2008), he explains how the only way to change culture is to create culture--instead of the oft-attempted methods of of condemning, critiquing, copying, or simply consuming culture. So instead of relating to culture passively, Crouch encourages us to actively create new cultural goods--everything from music, food, relationships, business, politics, fashion, and so on. But what does culture making look like for teenagers? Or what does culture making look like for someone who is in school or working at the grocery store? What part does the arts play in culture making? Listen in to our conversation with Andy Crouch as he answers these questions and more. Although your target audience was most likely not teenagers, what would you hope a teenager would gain after reading Culture-Making? Actually, I definitely hope teenagers will read the book! I tried to write it in a way that would be accessible to any motivated reader. The book is really written for people who are ready to take on more cultural responsibility. That describes not just teenagers, but college students, recent college graduates, people at turning points later in life . . . it's for everyone who has become a bit dissatisfied with the way they're relating to the broader culture around them. I think part of what happens in one's teenage years is that for the first time, often, you become keenly aware, first of all, that there is a "culture" that is shaping and forming you for better and for worse, and you start to make intentional choices about how to relate to that culture. So I would hope that teenagers would read Culture Making and learn how to interpret the culture they are in, and then start to imagine what they could creatively contribute to a world that often wants to treat us merely as consumers of culture rather than agents of cultural change. In your book, you describe culture as "the furniture of heaven." What do you mean by this? This came out of my reading of Revelation 21 and 22, where the apostle John, clearly influenced by the prophet Isaiah (Is. 60), describes the"kings of the earth" bringing "the glory and honor of the nations" into the New Jerusalem in God's restored, re-created world. (Isaiah is more specific: he mentions the ships of Tarshish, the camels of Midian, and the silver and gold of nations far and wide.) It seems that the New Jerusalem is full not just of redeemed people, but of redeemed cultural artifacts as well. This has fascinating implications. It suggests that at least some human cultural efforts will not simply disappear at the end of history: they will actually reach their intended fullness as the"furniture of heaven." And that means that it's possible that some of the culture that we ourselves cultivate and create might actually show up, in redeemed and purified form, in God's eternal good world. If that's a possibility, it gives incredible dignity and importance to our cultural efforts, and gives us an incentive for becoming as skillful and excellent in our culture making as we can be. What are some practical suggestions for becoming a skillful culture-maker? In one sense it is alarmingly simple. Skill in any cultural domain requires time. A lot of time. Recent studies (summarized by the journalist Malcolm Gladwell) suggest that 10,000 hours is about right for achieving real mastery in a cultural domain—whether architecture or painting, civil engineering or nursing. That's sounds like an awful lot of time, but it comes down to 2 hours a day, 5 days a week, for 20 years (with two weeks off for vacation every year :) ). And then what you have to do for those 10,000 hours is be willing to embrace disciplines: small, simple things done over and over that gradually develop the capacity to do more complex things. Drummers practice their rudiments. Painters work on the basics of the human figure and still lifes. Writers write in journals. Most of these disciplines stay completely invisible—no one would be interested in watching me play scales on the piano! But they make it possible for us to do the things that ultimately become culturally excellent. This is where being a teenager is really helpful. You have time! For a 40 year old to commit to 10,000 hours of practice of a particular cultural discipline is very difficult, sometimes all but impossible. But if you're 14 or 18 years old, one thing is pretty certain: assuming God grants you a normal lifespan, you will spend 10,000 hours doing something. Why not make some choices about what you want to devote your 10,000 hours to? By the time you are 40 you could have developed significant skill in a particular area—and all that in just two hours a day. You talk a lot about the artistic dimensions of life. What does culture-making look like in the arts? How can teenagers seek creativity and servanthood in the arts? That's a fantastic question, and it pairs two really important concepts: creativity and servanthood. I would say that genuine creativity requires a few important factors. First, it requires deep immersion in a rich tradition. If you are a dancer, learn everything you can about the history of dance, and see as much dance as you can. Second, it requires plenty of practice—see above. Third, it requires a willingness to open yourself to new experiences—to go places you wouldn't ordinarily go, to try food and books and places and acquaintances you might not normally seek out. Finally, once you've invested in all those prerequisites, you have to be willing to risk failure, and be fully aware that the great majority of the time, your creative efforts will fail. Failure is actually a key ingredient in developing full creativity! As for servanthood, I think this is a way that Christians can be especially distinctive and helpful in the arts. So often the arts in the modern era have been about self-expression. I think a more deeply Christian way to do art is to put one's artistic talents to work telling the stories and expressing the experience of people who otherwise would never be noticed: the poor, the forgotten, those in pain, those without a voice. So I would encourage artists of all kinds to seek out ways to represent other's experience in their work, rather than simply rehearsing their own self-expression. Most of us are just not that interesting! But also, for those of us who are in school or are stay-at-home moms or are working at the local grocery store, what does culture-making look like in those situations? I am very eager for us to recognize that culture happens just as much (and in fact, much more often) in the grocery store, at the playground, or in our own kitchen as in artists' studios, highrise office buildings, or Hollywood production lots. All of us are responsible for some cultural domain! I like to talk about two aspects of culture making: cultivating and creating. "Creating" is introducing something new into the world that wasn't there before. This can happen even in the most basic job (for example, when an employee goes out of their way to build relationships with fellow employees and to go above and beyond the routine with their customers). It can happen—has to happen, in fact—in parenting, as we respond creatively to the unpredictable directions our children's lives and interests take us. "Cultivating" is not so much about creating something new, as keeping something that is already good, good. I think Christians have often been very quick to point out what is wrong in our cultures—and certainly there are plenty of things to criticize. But much of every human culture is actually in many ways very good, and "cultivators" are people who keep that good. When I dust the shelves in our living room, do the dishes, weed the garden; or when I take out the trash at work, tally up the cash register at the end of the day, or send out this month's round of invoices, I may not be doing something deeply "creative," but I am still cultivating: tending and keeping these processes that contribute, hopefully, to a flourishing human environment. So I would ask of every occupation (paid or unpaid): "What am I cultivating—keeping good? And what am I creating—offering that is new and helpful in this cultural environment?" Those aren't just questions for artists—they're for all of us. Do you know of any examples of teenagers who are culture-makers? Absolutely! Now let me acknowledge that to some extent, the teenage years are often more about cultural apprenticeship—putting in the first few thousand of your 10,000 hours—than about radical cultural innovation (though there are exceptions). A lot of what you're called to do in these years is simply learn about and become fluent in our amazingly complex culture. So I wouldn't want anyone to feel tremendous pressure to "change the world" right away . . . you might do more harm than good. But once you realize that culture isn't just something that happens in highrises and Hollywood, you realize that culture is happening in your high school, for example. Your high school has a very particular culture, for better and for worse, and just like every other human being you can ask, "What should I be cultivating here? What could I be creating?" The answer might be a school musical, a sports team, a school organization . . . all these are very much part of the culture of your school. I have also had the chance to meet a few teenagers who are creating culture at much larger scales. I think of Zach Hunter, who started the campaign "Spare Change to Loosen Chains" or Emma Sleeth, who has written the book It's Easy Being Green. If God has given you a vision to do something like that, go for it! But don't be at all troubled by starting much smaller. Most of the teenagers I've met who have done something exceptionally prominent also have access to unusual kinds of social capital (certainly that's the case for Zach and Emma, whose parents are unusually well-connected and influential leaders in the Christian community). For the rest of us who don't happen to have a famous last name, the much more important thing is to get to work on our 10,000 hours. We won't be overnight successes, but there is no reason that we can't be making significant contributions to culture, no matter our background, if we steadfastly pursue excellence and integrity. If you could recommend 5 books to a teenager, which ones would you recommend? Victor Hugo, Les Misérables . . . the unabridged version. An extraordinary, moving story of grace and forgiveness played out over the course of a whole life. Eugene Peterson, A Long Obedience in the Same Direction. Probably the book that had the greatest direct influence on me as a teenager, albeit just barely still a teenager—I read it my freshman year in college. Homer, The Odyssey. Read this one three times: once from the perspective of its hero, Odysseus; once from the perspective of Telemachus, his son; and once from the perspective of Penelope, his wife. You'll see different things each time, including some that will trouble you . . . this is definitely not a work of Christian fiction! Shakespeare, King Lear. Read this out loud with some friends. What does this play say about family, loyalty, power, success, failure? Do you have any suggestions for an aspiring writer? Obviously, you did not start out as a writer, so what has shaped your profession? There are really only three things an aspiring writer must do. 1) Read. Read widely. Read as much good writing as you can, and avoid reading bad writing as much as you can. Read novels, read poetry (out loud), read journalism, read about a field you know nothing about: read, read, read. 3) Be edited. Find someone who is a better writer, a better thinker, and wiser than you (although they don't have to be older—one of my best editors ever was someone I first met when she was a college student and I was a campus minister). Ask them to be brutally honest with you about the strengths and weaknesses of your work. As far as possible try never to publish anything (keeping in mind that publish essentially just means "to make public") without submitting it to an editor. As you can see, none of these essentials requires you to have a"career" as a writer. In fact, like being in love and singing the highnote, being a writer often happens just when you stop trying too hard to be one. Wow! It was really exciting to see this! I've just recently read the book because my Dad told me about it and had been thinking about culture, etc. Thanks!